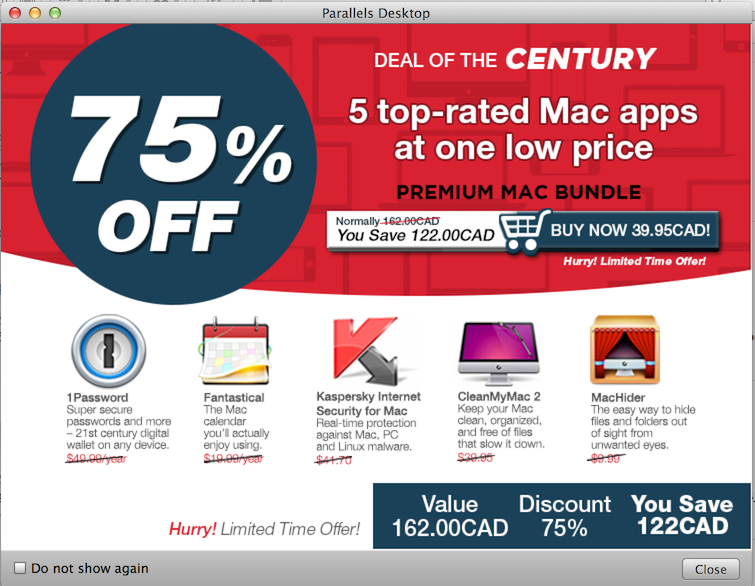 Hey Parallels - You have our money, now leave us in peace! You bought a General Motors car last year. Today you jump into it, turn on the radio and before you get to hear the station that you normally tune into every day, today is different because of instead of hearing the radio, you get some General Motors sanctioned advert intruding in your car experience. This is precisely what happened today with my copy of Parallels (which allows me to run Windows and other OS's on my Mac). Having purchased the product some time ago and always being able to start and use it without interruption, this screen appeared. I don't know why some software companies feel this type of intrusion is OK. I've bought the product, now leave me alone to use it in peace. My rage with this type of "squeezing advertising into every nook and cranny" grows when I think about how this interruption was obviously tabled by Parallels staff and some executive there actually thought that putting tawdry advertising on the desktops of customers who've paid $80 for their product already was a good idea.